A Castleford couple found themselves with an alternative wedding cake when they turned up to their reception – one made entirely of pork pies! 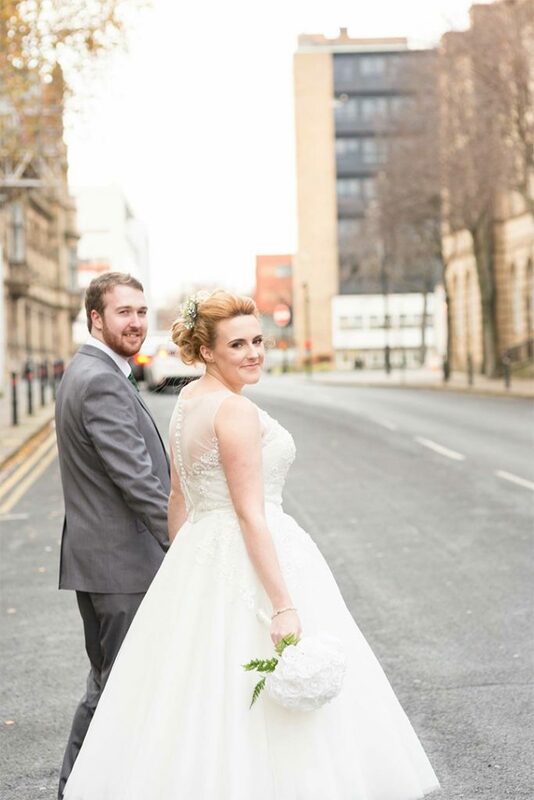 Chris and Jade Moran had chosen the Beer Exchange in Wakefield for their wedding reception in early December. During pre-wedding visits to the Beer Exchange the pair sampled Eric’s pies that manager, Dave Owens served up to his regulars and requested them as part of the wedding buffet. Little did they know that Dave would make a feature of the pies by tiering three of Eric’s larger pies and placing smaller pies around the outside to resemble a wedding cake. “We had talked about the pork pies with Dave. He had mentioned the big ones and said he would get us a complimentary one but we had no idea he was going to make a wedding cake out of them,” said delighted bride Jade. Together for nine years, the happy couple had originally planned a small wedding involving friends and family, a buffet and some music. They chose the Beer Exchange as it ticked all their boxes. “We planned it all in four months at a cost of £2,000. The idea was simple – ‘we’re married, now let’s party,” explained Jade. “Chris loves real ale and home brew while another family member loves gin. We could have the Beer Exchange to ourselves from 11am to 5pm before it opened to the public and Dave also sorted out the music for us. He was a star. It was a fab day – even the weather was kind!” said Jade. Eric’s pork pies are regularly on the menu at the Beer Exchange which offers traditional cold bar snacks to go with its impressive range of real ales and specialty gins. They can often be found on the bar for customers to enjoy with their favourite tipple.